Chrichton's World: Review Ash vs Evil Dead (2015 - ): This is how the Evil Dead 2013 film should have been. Groovy! 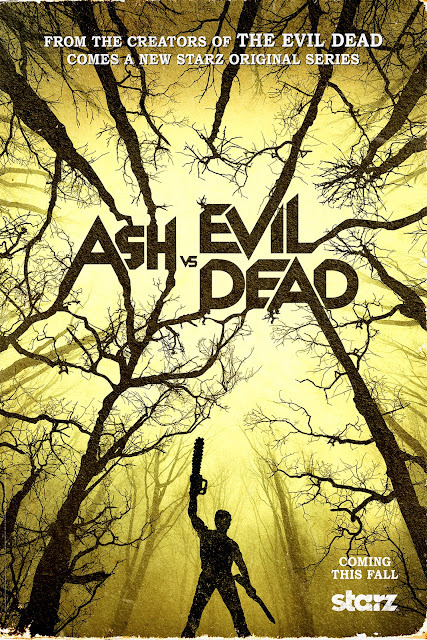 Review Ash vs Evil Dead (2015 - ): This is how the Evil Dead 2013 film should have been. Groovy! When news reached me that they were going to make a series with Bruce Campbell returning as Ash I couldn't be happier. Now after having seen the complete first season I am ecstatic. The show brings us everything we loved about the movies and brilliantly mixes it up with some newer effects. More importantly the humour is back. Cocky Ash is goofing and being badass at the same time. The deadites are as menacing as they ever were but still there is a light campy approach to them that I always loved about the movies. Ash vs Evil Dead simply is B Movie bliss in TV format. On top of this you have Lucy Lawless featuring who masterfully plays a pivotal role into the new terror that is to come. I doubt it that you can predict her role. One important thing to note is that the show is not afraid to show us blood and gore. You will get to see all of it as detailed as possible. Does it matter that sometimes it's easy to spot that the blood and gore is CGI? Hell no! Like the films the show is energetic and fun. Oh yes, it's super fun. Or as Ash would say: GROOVY! It makes you overlook certain flaws and mistakes. Sam Raimi and Bruce Campbell together always were a magical combo and this just proves that again. The first season does not end entirely satisfactory although it makes sense. You need to have a good reason to continue onto the next season and the ending provides that. So I am game! Ash vs Evil Dead starts with a bang and I am sure it will keep on rocking and grooving. Join the ride it's fantastic!